Tatum Parker receives her Butler acceptance letter from Trip and Michael Kaltenmark. Photo courtesy of Tatum Parker. Two weeks into the 2023 Acceptance Tour, Butler Blue III, also known as Trip, has had the pleasure of letting approximately 18 students know that they are #ButlerBound. 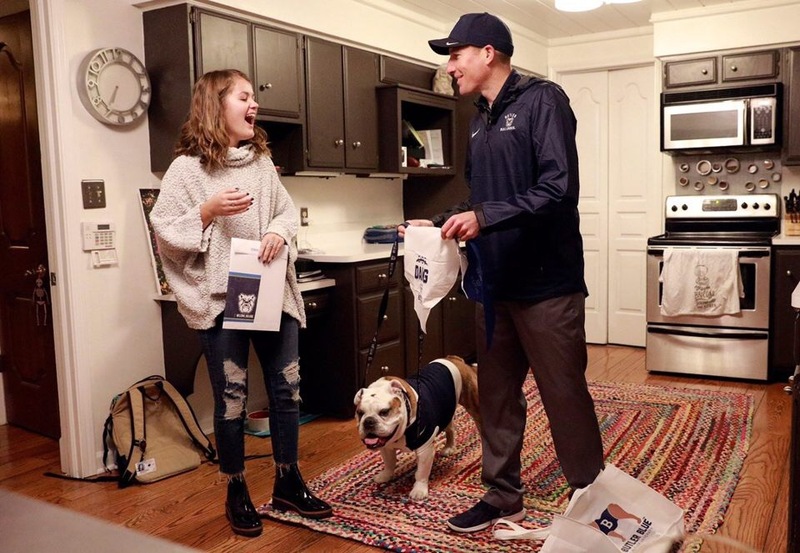 Early weekday mornings, Trip and his owner Michael Kaltenmark, director of community and government relations, arrange to show up at family’s homes to surprise students with their acceptance letters in person. “The trips are an opportunity to go to places where Butler maybe isn’t as well known and share our brand and the good news with families,” Kaltenmark said. High school senior Katelyn Soards is one of the students Trip and Kaltenmark have surprised so far. While Soards was already set on coming to Butler, she said that Trip’s visit was the cherry on top. “Butler connects with students on a personal level that I haven’t seen from any other college,” Soards said. The tradition started four years ago. When Trip and Kaltenmark were on the road with the basketball team, an idea came to surprise accepted students. In 2015, Blue II and Kaltenmark surprised 37 students with the great news of their acceptance into Butler. The following year, Kaltenmark and Butler’s marketing team wanted to do even more. They accomplished their goal by visiting almost 100 potentially #ButlerBound students. Since then, Trip and Kaltenmark make about 75 acceptance visits a year, traveling to students from near and far. The farthest Trip and Kaltenmark have traveled to is Providence, Rhode Island. The dynamic duo has also made it as far as Omaha, Nebraska, and many places in between. Trip and Kaltenmark kicked off this year’s tour with a special visit to Tatum Parker, making her the first accepted student in the Class of 2023. Parker was picked specially because of her story — she beat cancer not once, but twice. Despite her struggles, Parker has still managed to deliver over $1 million worth of goods to kids with cancer. Acceptance visits are usually not cherry-picked. Kaltenmark randomly chooses from a list of accepted students when orchestrating the surprise. Last Thursday, when Kaltenmark arrived with Trip, the student cried tears of joy at the good news. Sam Weiderhaft, a current junior sports media major from Carmel, Indiana, said he was starstruck to see Trip in his house when he was surprised three years ago. At the time, Weiderhaft was not set on Butler. “Trip coming shifted my focus, making me pay a lot more attention to Butler,” Weiderhaft said. After Trip’s visit, Weiderhaft looked more into Butler and quickly found that it was the school for him.